I have been a fan of Wicked: The Musical and the novel Wicked by Gregory Macguire for such a long, long time. I love how many levels of morals and social issues the story has layered on top of each other. It’s a complicated story, and there’s nothing I love better! 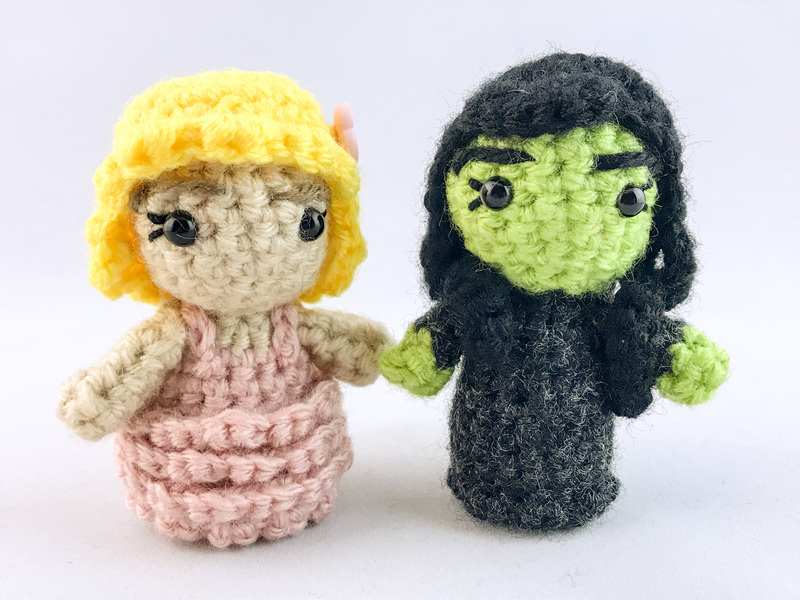 Naturally, it was only a matter of time before I made myself a little Glinda and Elphaba! Aren’t they just adorable? 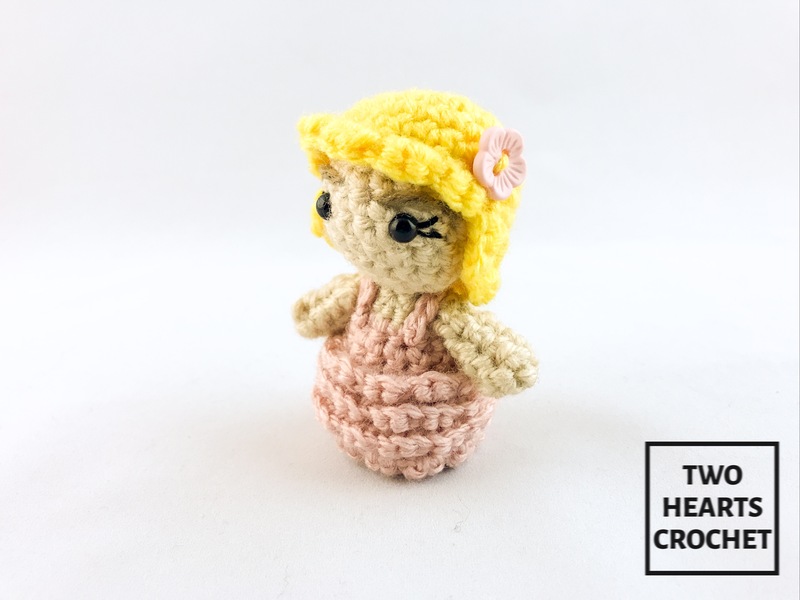 Follow the pattern directions below to make a mini Glinda the Good amigurumi of your very own! Missing Elphaba? You can find her pattern here. If desired, you can work these patterns in continuous rounds, rather than joining. The instructions are written for joining, but feel free to use the method you are most comfortable with! Insert the eyes into the 8th and 12th stitches of round 5, so that there are 3 sc stitches between the eyes. Carefully stuff the head, but do not overstuff! Carefully stuff the body, but do not overstuff! Use the tail end of the yarn and a yarn needle to sew closed the opening at the base of the body. Weave in ends. With PINK, insert your hook into the FRONT LOOP of the first st of rnd 19, ch 1. Then begin rnd 21. Rnd 1) In PINK, chain 12. Fasten off. At this point, you will be working back and forth, creating an opening for the doll’s face. You will now continue to work up the “side” of the hair piece, across the front to make the bangs, then back down the other “side” of the hair piece. 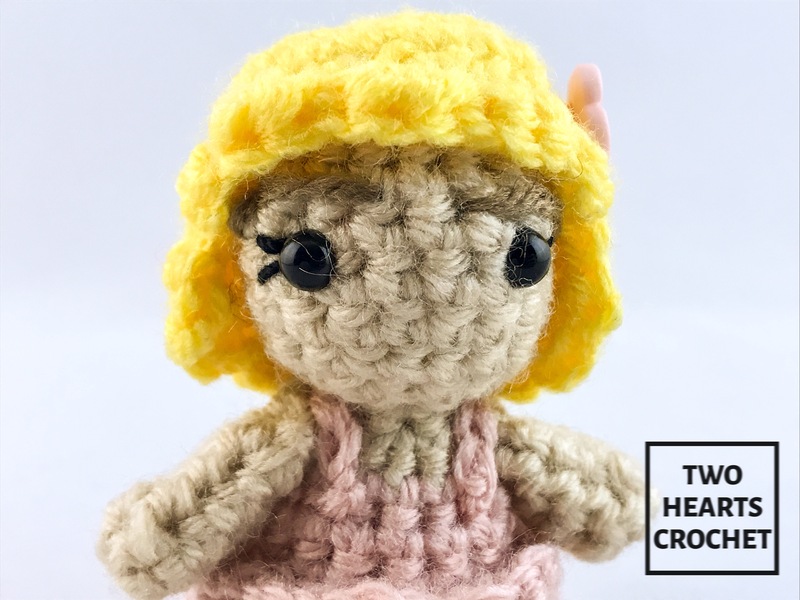 Use the tail ends of the yarn and a yarn needle to carefully sew the hair piece onto the doll’s head. Weave in ends. Use a yarn needle and the tail ends of the yarn to carefully sew the arms onto the body between rounds 11 and 12. If desired, you can stitch the openings at the tops of the arms flat before sewing the arms to the body. 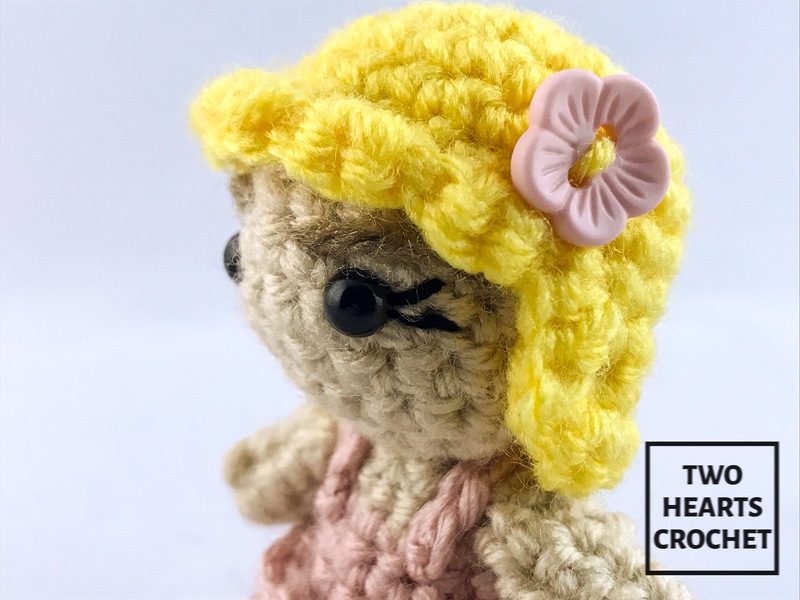 Sew the hair piece to the doll’s head. 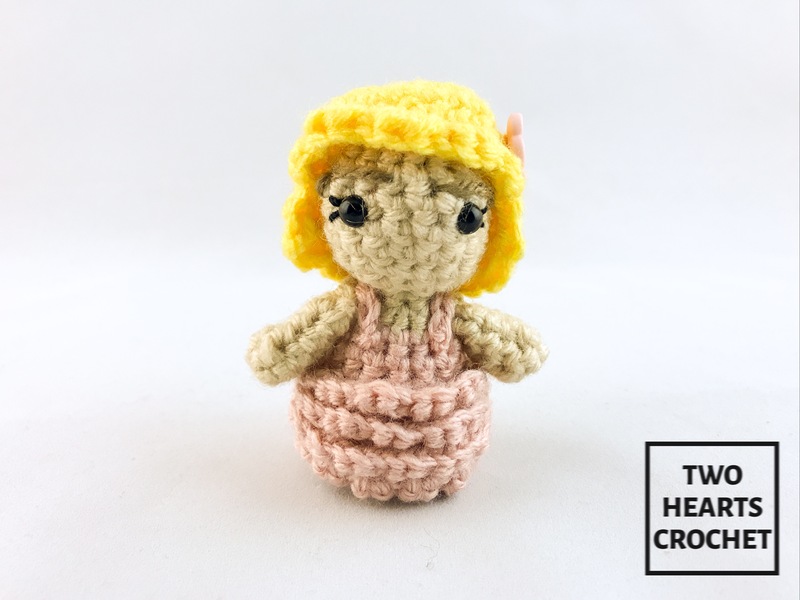 Use the tail ends of the yarn and a yarn needle to sew the halter top strap piece to the doll’s dress. Start at the front of one arm, wrap behind the neck, and then attach to the dress by the front of the other arm. See photos for placement if necessary. Sew the dress detail tier pieces onto the doll’s dress. Sew tier 3 on the bottom, tier 2 in the middle, and tier 3 near the top (near the doll’s waist). See photos. If desired, you can sew a pink flower button into her hair. 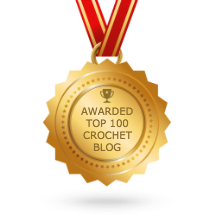 Use a yarn needle and a strand of TAN yarn to embroider on eyebrows. Use a yarn needle and a strand of BLACK thread to embroider on eyelashes. 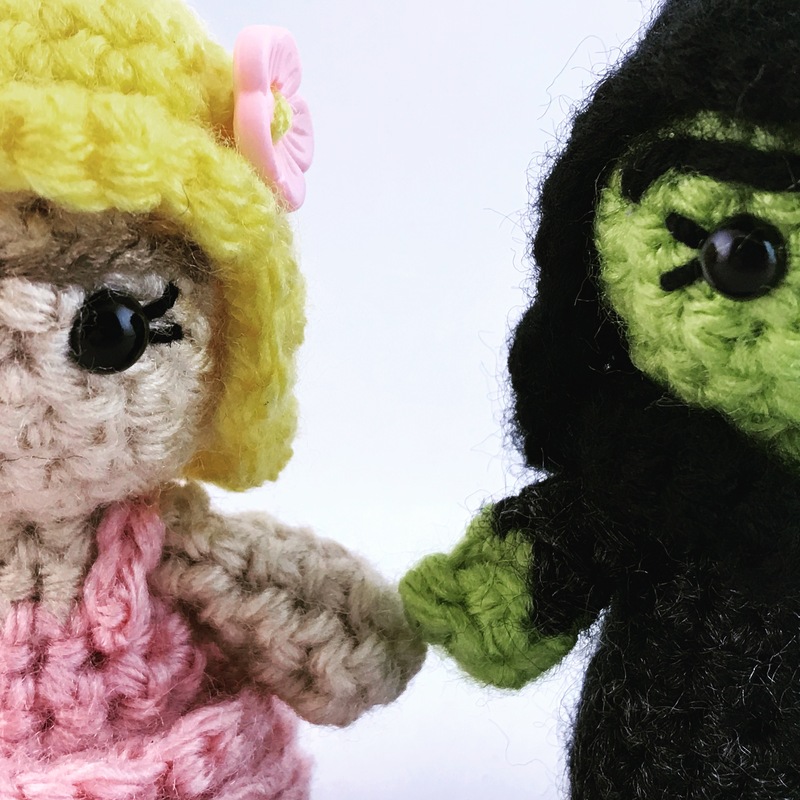 Disclaimer: This is solely a not-for-profit fan activity, and in no way intends to infringe on copyrights held by Stephen Schwartz, Gregory Macguire, or other professional Wicked-related agencies. 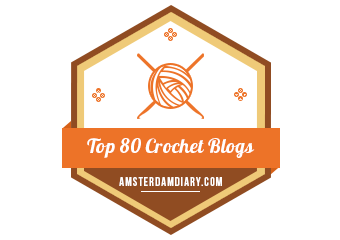 Subscribe and receive email updates of great blog content (like this!) straight to your email inbox. Who wouldn’t love direct content like that?